Successfully Added HK Warehouse Ulefone T1 Android Smartphone - MTK Helio P25 CPU, Android 7.0, 6GB RAM, 1080p Display, 16MP Cam, Dual IMEI (Black) to your Shopping Cart. Undergo an outstanding smartphone experience at an affordable price with the Ulefone T1. This Android phone features the MTK Helio P25 processor. This Octa-Core CPU has been clocked at 2.6GHz. It brings along a powerful yet energy-efficient performance. Therefore, you’ll be able to enjoy the most demanding software features throughout the day without ever slowing down your device. The Android phone furthermore has an incredible 6GB RAM and 64GB internal storage. For all the excessive smartphone users among us, the ROM can be extended via the phone’s 256GB SD card slot. Android 7.0 lets you use all the latest software features the industry has to offer. All can be downloaded easily via Google Play. With 4G support, this Android phone lets you browse the web anywhere you are. Whether you’re at home or outside, you’ll be able to take advantage of the fastest mobile data speeds out there. All your downloads can be enjoyed in crisp detail and stunning color on the phone’s 5.5-Inch FHD display. This screen supports 1080p resolutions to treat you to truly breathtaking visuals. The Ulefone T1 Android phone features two SIM card slots and Dual IMEI numbers. This means that you can stay connected to two network providers at the same time. If you are looking for a device that provides you with an efficient way to separate your work and private life, this cell phone is perfect for you. It furthermore comes packed with a high-end 16MP rear camera. This piece of equipment is great for snapping pictures and video alike of all those special moments in life. 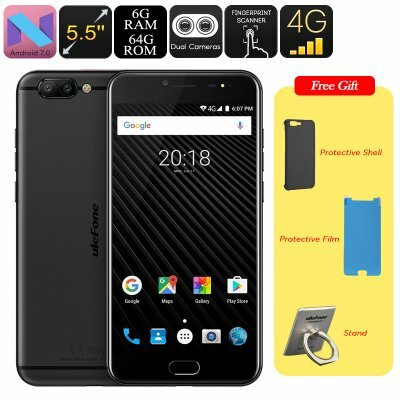 The Ulefone T1 Android smartphone comes with a 12 months warranty, brought to you by the leader in electronic devices as well as wholesale Android phones..